Warning: Disconnect power source prior to installing or servicing of the alarm. This alarm is to be installed by a qualified person in accordance with the local, state and national codes. THE SP-3000/SP-3100 LEVEL ALARM MAY ONLY BE INSTALLED INDOORS. Be sure to follow National Electric Code, ANSI/NFPA 70, when installing this unit to prevent moisture from entering or building up inside equipment. Install 9V battery (SP-3000/SP-3100 alarm only - not included). Replace battery once a year. Select an indoor mounting location. Install alarm on the wall at the desired height. Use cable tie supplied in the box to secure the float switch at the desired warning level in the tank (see diagram). Now manually test the alarm by tilting the float switch up until you hear the alarm notification and you see the alarm light turn on. Periodically test unit by pushing the test button on the cover to make sure the unit is working properly. Test alarm installation by pressing TEST button on the front of the alarm panel, The light and siren should activate. This test reflects there is electricity to the alarm. The float circuit may be checked by manually raising the float upward past 90 Deg. to the discharge pipe. 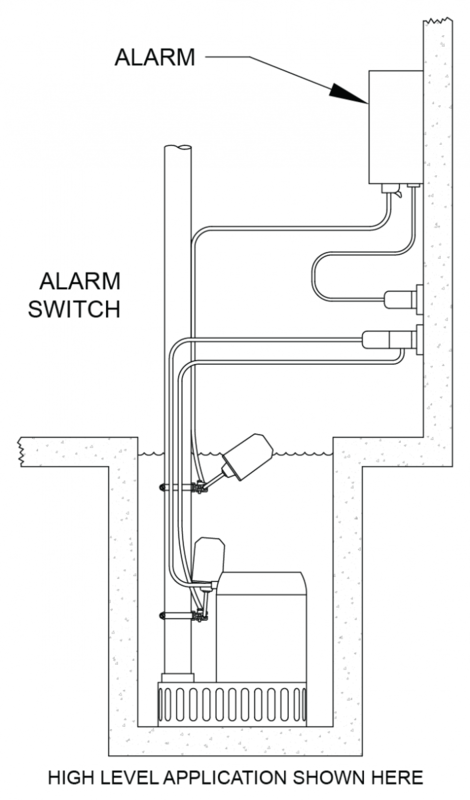 With the alarm switch in the alarm position, the alarm should give a visual and audible alarm. Disconnect power before installing or servicing this product, a qualified service person must install and service this product. according to applicable electrical & plumbing codes. Do not use this product with flammable liquids. do not install in hazardous locations as defined by national electric code, ansi/nfpa 70.